Very small amounts of lead are known to cause serious long term health effects. 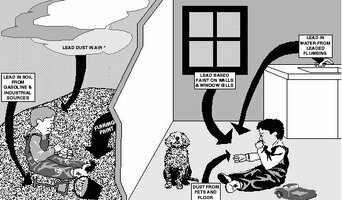 Young children are particularly vulnerable to exposure from lead because of their hand to mouth activity and because they play in garden areas where lead can be in the soil, but anyone can be poisoned. Homes built before the 1970's are most at risk, but even more recent homes can still have paint containing lead. Take care before you renovate and ensure you'd your family live in a healthy contaminant free home. Collie Water is a WA-based water company established to manage an industry-led solution to reduce salinity in Wellington Dam, the major water resource in WA’s South West. Collie Water is the trading name of the Myalup Wellington Water Corporation Pty Ltd. Collie Water was established by local water solutions provider Aqua Ferre in response to the WA State Government’s Water for Food project seeking private sector solutions for the Wellington Dam salinity challenge (the Myalup–Wellington Project). Collie Water was selected as the preferred proponent following a public Expression of Interest process run by the State Government. Owning a home, is often a complex commitment, and when we decide to make certain improvements, renovations, and or repairs, it's important, for us, to focus on why we're doing so, our purposes and priorities, needs, and concerns, as well as understanding, which ones might provide the best bang - for - your - buck, or Return on Investment, known as R.O.I. Some of the factors to consider include whether the work is necessary, structural, or our individual financial/economic situation, and how long we plan to remain in this home. Securex are Providing Security Systems, Alarms, CCTV Systems, Video Intercoms & 24Hr Monitoring Services to Perth homes & businesses since 1996. Their security package is designed to help protect your home in a way that works for you and your budget. Learn more about us at Dustless Blasting Services and find out why so many professionals in so many industries choose Dustless Blasting for their projects. We provide the highest of quality services and offer friendly advice on a range of topics to help you get the best results possible. unlike most assessors/designers who claim themselves as green building designer or 6 stars house or the like, this profession is a 2 in 1, compliment each other. When starting the design, ensuring best thermal comfort starts at the same time. I concern that thermal comfort is to be achieved is each room therefore energy efficient and thermally comfort to live in, not just complying the regulation. Perth Tree Services is a family run business based in the southern Perth suburb of Willetton has more than 40 years of experience working in tree removal, tree pruning, tree trimming, tree lopping and stump grinding. We are west australian tree professionals provide excellent customer services and professional work for both Residential and Commercial, in the city built atmosphere as well the country & agricultural forestry area. Perth Tree Services is the best tree removal company perth that delivers friendly and top services with a helpful approach. AQWA is a private company dedicated to educating the public on the marine life of Western Australia from the cold waters of the southern ocean to the coral reefs the far north. Owned and operated by Coral World International, AQWA is passionate about marine education, conservation and rehabilitation through extensive education programs for schools and rehabilitation programs for injured marine animals. The company also provides exhibits that provide a window to the vast and prolific communities that exist on the sea floors. AQWA's goal is to inspire respect for marine life while also raising awareness of the critical importance of the ocean in our world. On your iPhone or Android device and you’re two taps away from getting the service you need from the nearest Roadside, Towing and Moving service provider. What do environmental and restoration professionals in Perth, Western Australia do? Specialists and consultants can be hired to carry out large-scale building restoration projects, or to restore period features such as interior trims and mouldings. They will first inspect and assess your home, and will provide restoration advice based on the extent of damage. It’s important to note that some heritage-listed buildings may have lead paint on walls, doors, windows and windowsills. Lead that gets disturbed by sanding, cutting or replacing old windows can create hazardous lead dust. If your Western Australia home was built before 1978, you’ll want to find restoration professionals with experience and training in lead-safe procedures. Homes that have water damage, mould, or which have been affected by a natural disaster will need specialty restoration experts. They will secure your home and remove any dangerous contents before beginning repair work. Should you suspect mould in your house, a qualified professional will do a full visual inspection and perform air/surface sampling to confirm its presence before safely removing the mould. Special training, equipment and licensing are required. Make sure you are working with Western Australia certified, licensed and insured professionals who guarantee and warranty their restoration work. Find environmental and restoration professionals in Perth, Western Australia on Houzz. Search qualified professionals in water damage restoration, fire damage repair, mould removal, and heritage renovations. Read through professional profiles for information on qualifications, experience and services provided.